If you get eight hours of sleep a night as most doctors recommend, you will spend a third of your life sleeping. So it's worth taking some time to think about what you're sleeping on. New research indicates that the popular thinking - sleeping on a firm mattress is better for people with chronic lower back pain - is incorrect. The report appears in the current issue of the "Lancet," the British medical journal. The Early Show medical correspondent Dr. Emily Senay explains what the researchers found and gives some general health tips about mattresses. Up until now, the common belief has been that a firm mattress is the best thing for people with lower-back pain. Why? Because of all the anecdotal stories from people with back trouble who have put a board under their mattresses or decided to sleep on the floor when their backs hurt and discovered they had less pain. Most orthopedic specialists, with the exception of most chiropractors, have felt comfortable recommending that their patients with low-back pain sleep on firm bedding, although there hasn't been any solid evidence to prove that it was effective. Lancet's study was done in Spain and it's significant because it's the first substantial study that has assessed the effect a mattress can have on someone with lower-back pain. There were 313 adults in the study who all had unexplained chronic lower-back pain. This means it wasn't associated with any particular condition. And, all of them had previously complained of feeling pain in their lower backs when lying in bed and when they were getting out of bed. They were given new spring mattresses, but they didn't know which type they were getting or that the mattresses would be compared. Approximately, half were given firm mattresses and half were given medium-firm mattresses. After 90 days, researchers found that those who slept on medium-firm mattresses were twice as likely to report improvement in low-back pain than those who slept on firm mattresses. 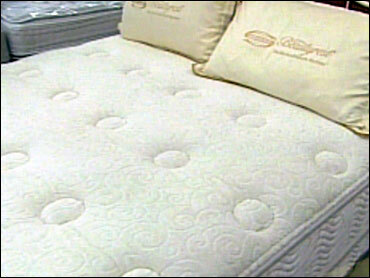 The results are attributed to various reasons, including that people participating in the study needed new mattresses. But the study says the key reason is that a medium-firm mattress better distributes pressure from the body, which causes less pain when lying down or after getting up. If a mattress is too firm, it doesn't contour enough to the body or give the lower back support when you're lying on your back. It also doesn't allow shoulders and hips to sink in enough when on the side. A soft mattress can contour too much and not give enough support, which can cause problems. The firmness of the mattresses was rated on a scale of one (firmest) to 10 (softest). The firm mattress used on the test scored 2.5 on the scale and the medium mattress was a 5.6. The reason people who slept with a board under their mattresses or on the floor say their backs felt better is because it prevented their backs from moving, which reduced pain. The majority of participants in the study reported an improvement after getting a new mattress. This tells us that not one mattress is right for everyone and it's important to replace a mattress when you need to. These days, according to the Better Sleep Council (BSC), consumers are tending to replace their mattresses after 10 years in comparison to 1998, when they were doing so after 14 years. Most mattresses have a warranty from the manufacturer for 10 to 15 years, but that is for the components of the mattress. It doesn't have anything to do with comfort. To get the full life out of a mattress, it's important to follow the suggestions from the manufacturer and the retailer. They will recommend that you periodically rotate the mattress and turn the foot of the bed to the head. Do it at least twice a year. A Chiropractors Association spokesperson recommended doing it at least every three months. The purpose of rotating to avoid creating an indentation where you sleep. You don't want to start sinking into the bed, which can cause back problems. It's best to sleep on your side or your back. If you lie on your stomach, you will have your head turned and put stress on the disks in your spine (lumbar curve). Don't use a pillow that props your head up or allows it to hang down. Even when you're on your back, you don't want your head down. Use a pillow that keeps your head aligned with the bed, so that you are maintaining the natural curvature of your spine. The study offers enough evidence to help physicians feel comfortable recommending medium-firm mattresses to people with lower-back problems.